CULLMAN – The Cullman City School Board early Thursday morning approved the early adoption of the state’s 2.5 percent pay raise for teachers. The increase will go into effect in July, ahead of the beginning of the new school year. Cullman City Schools Superintendent Dr. Susan Patterson is excited to go ahead and apply the raise early and believes CCS teachers are more than deserving. East Elementary Principal David Wiggins was on-hand to present the current state of his school and share ideas for how to continue improving. One of the ideas currently in place at East is the “Bigs and Littles” mentor program. 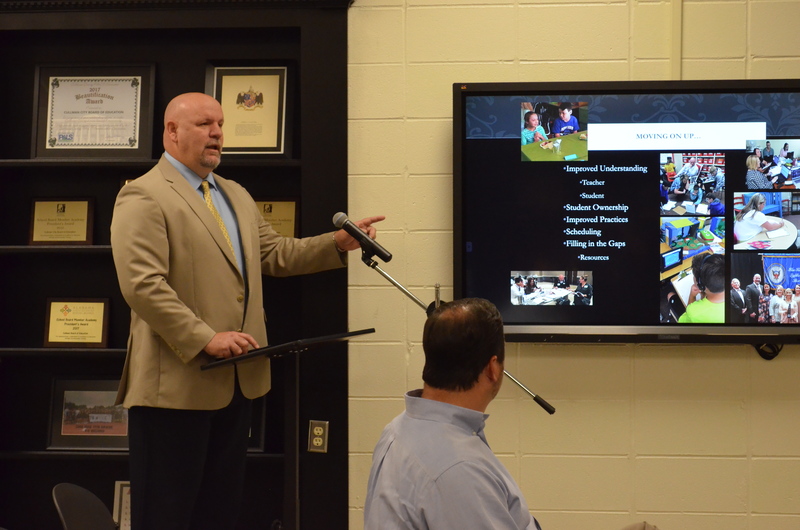 Wiggins elaborated on some other programs in place at East Elementary that have been successful such as Cubcat Clubs, the new outdoor classroom, student-lead conferences and more. Wiggins is excited to be able to expand some of these programs going forward and continue raising expectations at East Elementary. Several new faculty members were also introduced at Thursday’s meeting. Cullman High School (CHS) Principal Kim Hall introduced Heather Carter and Caroline Lunsford to the board as the newest additions to the high school teaching staff. Hall believes both new additions will fit in well at CHS. Wiggins also introduced a new teacher that he is bringing on to the East Elementary staff. Nicole Heptinstall will be coming on as a third-grade teacher to replace Alex Patterson, who, according to Wiggins, is moving to Hazel Green to be closer to family. Heptinstall has filled in for teachers at East Elementary twice over the last two years and Wiggins said he is excited to bring her on full time. – permission to bid #06-21-18-01 and accept the lowest responsible bidder for occupational and physical therapy services. – Cullman High School to enter into an agreement with BSN Sports/ Under Armour Athletic Apparel to be an exclusive Under Armour school beginning May 1, 2018 through May 31, 2023. – Cullman City Parks and Recreation to conduct summer theatre camp at Cullman High School. – FY2019 Head Start Salary Schedules. These schedules have been approved by the Head Start Policy Council. – Cullman City Primary School to supplement the mathematics instruction with Kindermath for kindergarten and Miss Giraffe for first grade. Submitted and agreed by the CCPS Textbook Committee. – permission to contract with Wayne Cooke and Sarah Jane Skinner to conduct summer theatre camp (paid by Cullman Parks and Recreation Camp fees). Cullman City Primary School – Aug. 3, 2018 – 4-6 p.m.
East Elementary School – Aug.1, 2018 – 4-6 p.m.
West Elementary School – Aug. 2, 2018 – 4-6 p.m.
Cullman Middle School – Aug. 2, 2018 – 5:30 p.m.
Cullman High School – Aug. 3, 2018 – 4-6 p.m.
Cullman City Head Start – Aug. 13, 2018 – 4 p.m.
Head Start Pre-K – Aug. 3, 2018 – 4 p.m. The Cullman City School Board will hold its next meeting Tuesday, July 17 at 7:30 a.m. in the Central Office Board Room.